I have been studiously studying my new book ‘zen camera’ and one of the lessons is to try and tell a story with your photograph. That’s what I was aiming for with today’s shot. In our busy cafe where we lunched everyone was en famille, or with friends, except one. 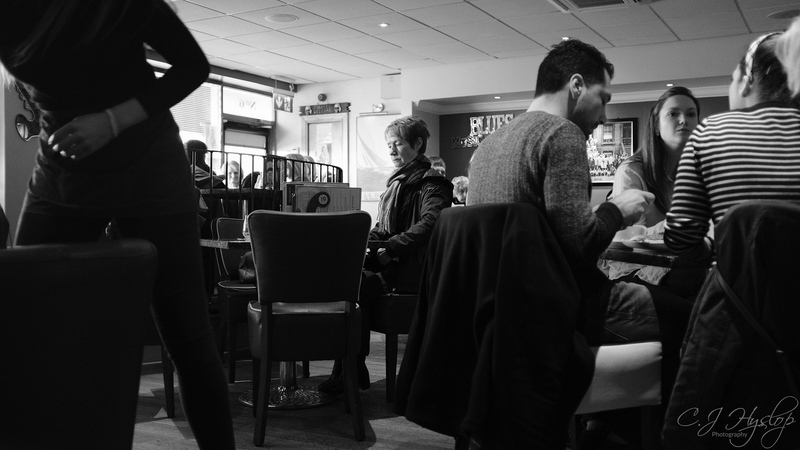 Posted in 365, B&W, Fuji X100F, People, Photography, UncategorizedTagged 365, alone, Black&white, cafe, day41, Fraggle, Fujifilm X100FBookmark the permalink. Maybe one other, on the far left, behind the woman, was alone? Anyway, this is the kind of shot I wish I could get more often. Most of my stuff is pretty anti-social, if you look at it. And, as far as your book, it has some great stuff in it, especially story telling. Jay Maisel is good at this, too. Also, one of our local photographers, busy in the local scene, is Nancy Lehrer. I really like her stuff – you can find her at https://inancy.wordpress.com/ and on Facebook. If you do an historical read of her blog, you will see her development over the years. Nice shot altogether! PS: I hope Sophie recovers soon – a photography buddy is great to have! I always like your people shots, always something to find be it an object or a thought.